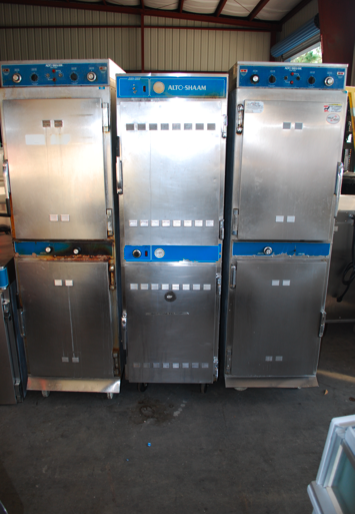 One Fat Frog Restaurant Equipment has several used cook and hold ovens available at discounted prices. All used cook and hold ovens are cleaned, refurbished, and tested twice by One Fat Frog Restaurant Equipment’s in-house technicians. If you’ve been thinking about purchasing a used cook and hold oven for your restaurant, come into One Fat Frog Restaurant Equipment. Here’s some information on the functions of cook and hold ovens. Cook and hold units allow for precise cooking of various menu items and offer operators the ability to hold the food product at a a specific temperature until it is time to serve it up to eager customers. Most cook and hold units transition from cooking to holding modes on their own. Commonly, chefs will use cook and hold ovens as prime rib ovens, but cook and hold ovens can be used for so much more. Cook and hold ovens can cook all proteins, hold convenience items like baked potatoes and tamales, and even bake a cake! Other applications for cook and hold ovens include: braising, sous vide-stle cooking, proofing bead dough, and re-heating convenience items. Cook and hold units’ low and slow cooking process allows them to make tougher cuts of meat tender. Most cook and hold ovens allow the operator to cook by either time or by probe. One Fat Frog Restaurant Equipment offers quick cash deals, package deals, and financing for the entire stock of used commercial restaurant equipment – including used cook and hold ovens. Come into One Fat Frog Restaurant Equipment today and check out our stock of used cook and hold ovens!